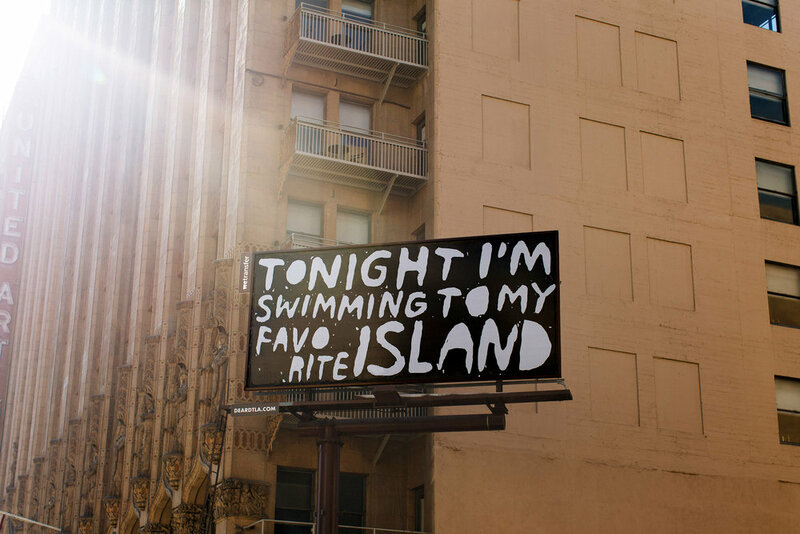 From July 2015 to February 2016, Ace Hotel and WeTransfer launched an art project called Dear DTLA, combining Ace’s real-world billboard at the Downtown Los Angeles property with WeTransfer’s digital content-sharing. With the billboard as a blank canvas, I was fortunate to help reach out and work with some amazing artists in LA and around the world to design a visual experience. Each artist created corresponding digital components — from GIFs and photographs to interviews, songs and even origami instructions — available for download through WeTransfer, expanding the work’s reach worldwide. Dear DTLA invited eight artists — Brian Roettinger, Mariana Fernandes, Robert Montgomery, Cali Thornhill DeWitt, Stefan Marx, Wonwoo Lee, Yung Jake, and Ana Brotas — to send a message to Downtown Los Angeles and on deardtla.com, which documented the monthly progression of the series.